The Maitland News was a local newspaper originally published by the Maitland Realty Company (and later by the Maitland News Company) which began circulation in April 1926. This edition features articles on topics such as an increase in the Chamber of Commerce membership, a Founder's Day celebration, Winter Park buys tract of land for a park, the annual meeting of the Maitland Auxiliary, a Valentine party, special meetings held at the Presbyterian church, a Parent-Teacher Association meeting, a new electric sign at Maitland Garage, an Orlando fruit fair, a call for a song about Maitland, boat racing on Lake Maitland, water pressure, good merchandising tactics, an Orange County fruit exhibit at a Tampa fair, the housing arrangements of local residents, and a local events calendar. Also featured is a classified section with items for sale and several advertisements for local businesses. Pages 3 and 4 are missing a section that has been clipped out. Original 4-page newspaper edition: The Maitland News, Vol. 02, No. 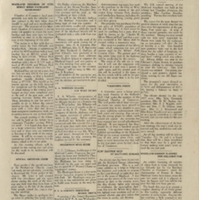 6, February 9, 1927: Newspaper Collection, accession number 2014.002.020V, room 2, case 2, shelf 10, box GV, Maitland Historical Museum, Art & History Museums - Maitland, Maitland, Florida. Digital reproduction of original 4-page newspaper edition: The Maitland News, Vol. 02, No. 6, February 9, 1927. “The Maitland News, Vol. 02, No. 6, February 9, 1927.” RICHES of Central Florida accessed April 19, 2019, https://richesmi.cah.ucf.edu/omeka/items/show/6468.